When shopping for a stone in the form of the cushion cut, it might surprise you that this marvelous shape is only the tenth most popular cut in the world. This breathtaking cut is undoubtedly deserving of a higher notch on the popularity totem pole and it is no surprise that it is still a widely sought after cut for engagement and wedding rings alike. If you are considering a Cushion cut stone, it is essential to be well informed of the pros and cons that come with the cut, the most suitable GIA grades for the cut, and the most sensical settings for the cut. This article will walk you through the in’s and outs, as well as the in between, of the Cushion cut. The Cushion cut is one of the oldest documented diamond cuts and, as such, it is often associated with vintage and classic style rings. The vintage cut rose in popularity in the late 1980’s and early 1990’s, then dropped off until the recent resurgence of popularity in the demand for vintage and classic style jewelry. Generally speaking, a Cushion cut ring will have a rounded, rectangular “pillow-like” appearance – but looking more in depth, there are different styles of this particular cut. While shopping for your Cushion cut stone, you might hear the terms “standard” Cushion cut or “modified” Cushion cut – in terms of a standard or modified Cushion cuts, the only difference is the history where the standard Cushion cut is the original and the modified cushion is its modern variation with minimal differences in appearance. This is important to know if you are in the market for a vintage ring where a modern variation of this classic cut should throw up a red flag. The difference in stone appearance itself is seen in the variation between the chunky look and the crushed ice look. A chunky Cushion cut ring will have apparent distinction in the pattern of the facets. Although the chunky Cushion cut may sometimes get referred to as the antique Cushion cut due to its resemblance to the Old Miners cut, this is an inaccurate titles as this particular style cut is relatively modern. The crushed ice Cushion cut is actually much truer to an antique style cut – this cut has no discernible facet distinction which makes it appear similar to crushed ice. 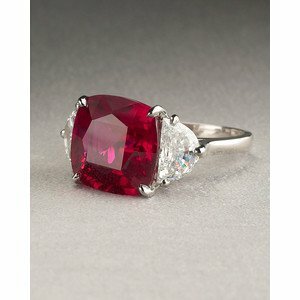 Cushion cuts are regaining popularity with the growing demand for antique, or faux antique, jewelry. This gorgeous cut is reminiscent of the past, and this historical asset it possesses is one of the key components of its resurgence in popularity. Other than being reminiscent of the past, this stunning cut disperses light through its 60 facet, creating an alluring and enticing rainbow effect of color created by the angles of the diamond. This cut compliments the quality of the stone effectively and is an easy choice for a bride that wants to accentuate a high quality diamond while still displaying a little bit of brilliance. Durability and sustainability are two additional factors that make this cut extremely desirable. Cushion cuts lack the sharp edges of other popular cuts, and as such, don’t chip or break as easily as many others. The biggest negative associated with the Cushion cut is its lack of brilliance – but this negative is dependent on preference and may not be a negative for some. This lack of brilliance is tied into the historic relevance of the cut as it was specifically designed to subdue the brilliance resulting from candlelight, rather than to exhibit the brilliance created by sunlight and artificial lighting. That said, modern advanced in cutting technology and laser cutting have increased the brilliance of this modern cut, but it still lacks this factor when compared to some of the more popular cuts. The cushion cut also has relatively large facets making this an unforgiving cut for poor quality diamonds and gemstones – with the necessity for a higher grade stone comes a heavier price tag, making the unaffordability of this cut a pretty big deterrent for the bride and groom to be on a budget. An ideal diamond for a Cushion Cut will be anything from VVS2 and up. Avoid Cushion cuts that fall into the categories of SI1, SI2, I1, I2 and I3. The ideal diamond for a brilliant round cut is colorless, so grades D, E, or F – however a nearly colorless grading that’s closer to the completely colorless spectrum, such as G, will also produce desirable results. The ideal setting for a Cushion cut is a 4 prong setting. A 4 prong setting will allow light to cut through the diamond and maximize the brilliance that the cut is in need of. 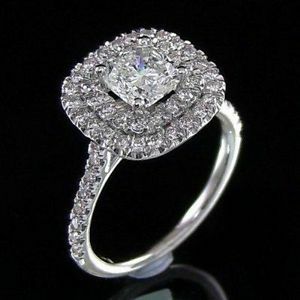 That said, for a larger diamond, a 6 prong setting might be necessary to avoid damage or looseness of the diamond itself. We must also mention that, of course, a cushion cut can be applied to other stones as well, so let it be known that it is not exclusively for diamonds, but other stones as well. A Bezel setting is popular amongst some for the Cushion cut but we do not recommend it. A bezel cut is one in which the metal of the band itself wraps around the stone – while secure, this setting takes away some light, which is a factor that this cut is in need of. Ok, so, what do we know? The Cushion cut is the oldest cut for stones – because of this, despite modern attempts to alter its appearance, the cut does not display the brilliance and fire of other more modern cuts. What it lacks in brilliance, the Cushion cuts makes up in sophistication and allure. The modified Cushion cut is the modern version while the standard Cushion cut is the original – a modern Cushion in an antique ring is questionable at best. The Cushion cut demands for high quality diamonds due to the fact that the cut itself accentuates the flaws of a stone and it is best set in a 4 prong setting that allows for premium sunlight to help its brilliance. 1. If your Cushion cut stone is a diamond, deal only with reputable jewelers that will provide IGA certification.